From the first growth spurts of the tiniest seedling to the final days of the mightiest giant, ants are there, shaping the lives of trees. When thinking of how ants interact with trees, a lot of people may think of carpenter ants eating trees — and the wood in their home. In fact, in both our forests and houses, these denizens of hollow trees and rotting rafters are merely the final stage of a lifelong relationship between trees and many kinds of ants. Take a closer look at the many healthy seedlings, saplings and trees near your home. Anywhere you look, you will probably find a worker of one of the many ant species associated with the trees in our forests. Follow her back to her nest, and you’ll start to learn about the intertwined lives of ants and trees. The trail of workers often will lead back to a volcano-like heap of soil. Depending on the species, such anthills can range in size from a tiny pile of sand grains that is less than an inch across to a huge mound several feet high and many cubic yards in volume. This is where the lifelong connection between ants and trees begins. Anthills are the product of tens to tens of thousands of burrowing, tunneling worker ants that have excavated mineral soil while building temperature-controlled earthen chambers in which to live, store food, protect the queen and rear her brood. 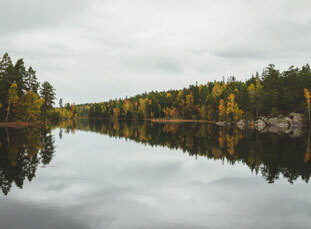 In the formerly glaciated parts of North America — most of Canada and much of the northern reaches of the United States — there are no native earthworms. In these areas, much of the topsoil was created by ants. In fact, ants create soil up to 10 times faster than earthworms, excavating as much as 30,000 pounds of soil per acre every year, creating about 4 inches of new soil per millennium in the process. In this way, ants are integral to the life of a tree from the very beginning. 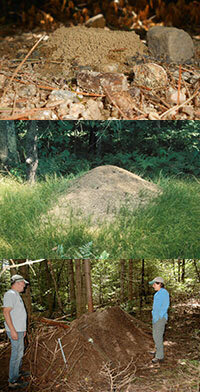 Ants create the best compost there is; anthills are localized hotspots of nutrients. 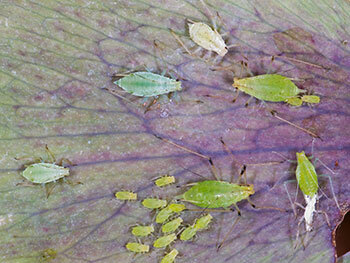 Their digestive cycle helps to create the nutrient-rich soil young trees need. As omnivores, ants collect and store large amounts of nutrient-rich prey. As they process this food, their wastes further enrich the soil. Ant nests are also close to pH-neutral: If the surrounding soil is acidic, ant nests tend to be more basic, and vice-versa. All of this means that a seedling that germinates from a seed that was lucky enough to land on the sweet, rich soil of an anthill will often get a head-start in the race for the canopy. As trees grow, they are set upon by true bugs (order Hemiptera) that feed on sap, such as aphids, among many other herbivorous insects. In some cases, the role ants play at this stage in a tree’s life can actually cause a population boom for these insects, as many of our most common and abundant ants, including Fuzzy ants (Lasius species) and species of Formica (Latin for “ant,” not the plastic countertop) care for the bugs. They stand guard over the bugs, protecting them from predators and occasionally moving them from place to place to tap new areas of the tree, all in exchange for the privilege of dining on their excreta. Only rarely will a mature tree succumb to this population boom, but seedlings or small saplings may not survive it. In response, some trees have evolved a work-around to the ant-bug mutualism, and feed the ants directly. In turn, for a reward similarly sweet to that which they would get from the bugs, the ants protect the trees. This type of ant-tree mutualism is common throughout the tropics, where a variety of trees produce specialized structures to feed and/or house ants. One of the classic examples of a co-evolutionary mutualism — two species evolving in tandem to the benefit of both — involves ‘ant-plants’ and ‘plant-ants’ in tropical forests. Ant-plants, such as Central America’s bull-horn acacias and trees of the genus Cecropia, have hollow structures — thorns and internodes in their hollow stems, respectively — in which ants form their colonies. 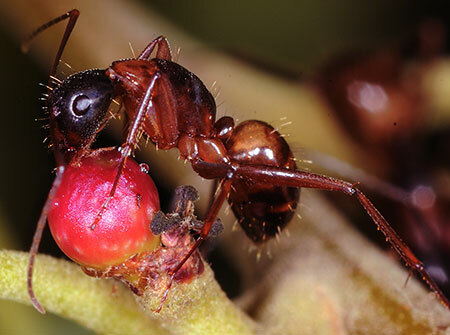 The trees also secrete sugar and protein-rich food bodies that make up a significant portion of the ants’ diet. In return, the plant-ants actively patrol the surface of the tree, aggressively fighting off herbivores such as caterpillars, as well as pruning off vines that could otherwise engulf the tree. These tightly-coupled mutualisms between ants and trees are still unknown in the temperate zone, though they do exist between ants and many common forest understory herbs, such as trillium and bloodroot, which provide similar food rewards for dispersing their seeds. Nonetheless, trees in temperate zones derive nutrients from the waste products — decaying food and nutrient-rich feces and excretions — of the many species of ants that nest and forage under bark and in the canopy. This kind of indirect mutualism — trees provide ants with shelter; ants feed on herbivorous insects; ant wastes nourish the tree — is widespread in most forests. Trees also can benefit from the voracious appetites of ground-dwelling predatory ants — another indirect mutualism between trees and ants. For example, in the eastern U.S., Formica neogagates opportunistically feeds on a wide range of caterpillars, including gypsy moths and eastern tent caterpillars. Other Formica species of ants prey on sawflies that mine birch leaves. Mound-building red wood ants (Formica rufa-group species) prey on a wide range of insects. In the western U.S., one of these mound-builders, Formica obscuripes, preys not only on caterpillars, but also on conifer sawfly larvae. 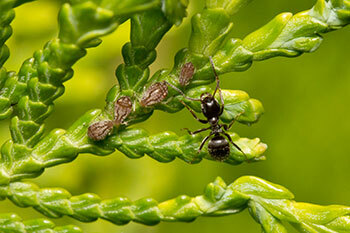 In general, when predatory ants are abundant, trees set more seeds, even if those ants also tend aphids and other bugs. Bark protects a tree from the elements, but over time, fissures open, cracks appear, beetles burrow, water seeps in and fungus follows. As the tree’s life comes to an end, ants are there, as they have been since the beginning. As the aging tree’s heartwood softens and rots, carpenter ants move in, removing the rotten wood and opening up space in which to nest. Their huge colonies, some with more than 15,000 workers, can live for decades; carpenter ants overwinter by huddling together for warmth, feeding on fats stored in their bodies and — when it gets really cold — filling themselves with glycerol, a chemical like antifreeze that stops ice crystals from forming inside their bodies. Nest of New York carpenter ants, Camponotus novaeboracensis. Credit: Elizabeth J. Farnsworth. Like many other ants, carpenter ants are omnivorous. They range widely, foraging for food, primarily at night, hundreds of yards from their nest. When the colony gets too big for their original tree house, they form satellite colonies in other rotting trees — and sometimes houses — nearby. The satellite colonies remain connected to the natal nest where the queen remains; workers move food and larvae to and from the satellites. Carpenter ants signal their presence as the sawdust they remove from inside the tree builds up at its base. When the dying tree finally falls, the decaying bole, with the help of soil nesting ants, returns its nutrients to the soil, bringing the cycle back to the beginning. 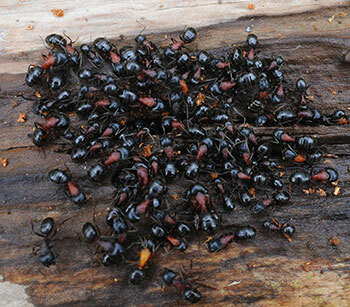 Many logs also nurse a new cohort of seedlings, which will in turn support a new generation of ants and their allies. 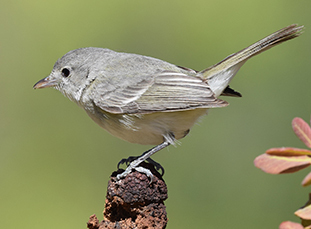 So before putting ant baits around the woodpile, remember that these little creatures, which in aggregate far outweigh all of Earth’s vertebrates — including people — really do keep the world turning. Aaron M. Ellison is the senior research fellow in Ecology at Harvard University’s Harvard Forest, and lead author of A Field Guide to the Ants of New England (Yale University Press, 2012). Learn more about ants and contribute your own observations and insights at www.NEants.net.